Stoker will forever be known as Chan-wook Park’s first English language feature film, and the comparisons to his Vengeance trilogy are hard to avoid. However, it is best to go into his latest film with an open mind. Stoker is strong enough to stand on its own, comparisons be damned. The film begins with a funeral for Richard Stoker (Dermot Mulroney), a wealthy man who passed away in a car accident on his daughter India’s (Mia Wasikowska) 18th birthday. She remains in the care of her estranged mother, Evelyn (Nicole Kidman), but they are soon joined by Richard’s long-lost brother, Charlie (Matthew Goode). Right off the bat it seems that something is amiss with Charlie. Goode plays him to smarmy perfection as he weasels his way into the household. Evelyn falls for his charms rather quickly; India, not so much. India is a complex girl. She’s quiet and often gets picked on at school, but she’s also not afraid to stand up for herself. The loss of her father has clearly been quite damaging, and Charlie’s insistence on building a friendship with her is not exactly welcomed. Yet as she learns more about her seemingly-vagrant uncle, she begins to discover things about herself that she perhaps didn’t know before. As such, Stoker is something of a “coming of age” tale. However, it’s unlike any such tale you have seen before. After all, this is a Chan-wook Park film with a screenplay written by Prison Break star, Wentworth Miller. Stoker is completely unnerving during its entire running time, and it seems determined to leave its audiences feeling as uncomfortable as possible. Violence is kept to a minimum, but Park plays with a number of social taboos, all using a distinct visual style that only he can offer. His use of color and flawless transition shots are a thing of beauty, even if at times they do distract from the film itself. The cast here is terrific, led by the very talented Mia Wasikowska. 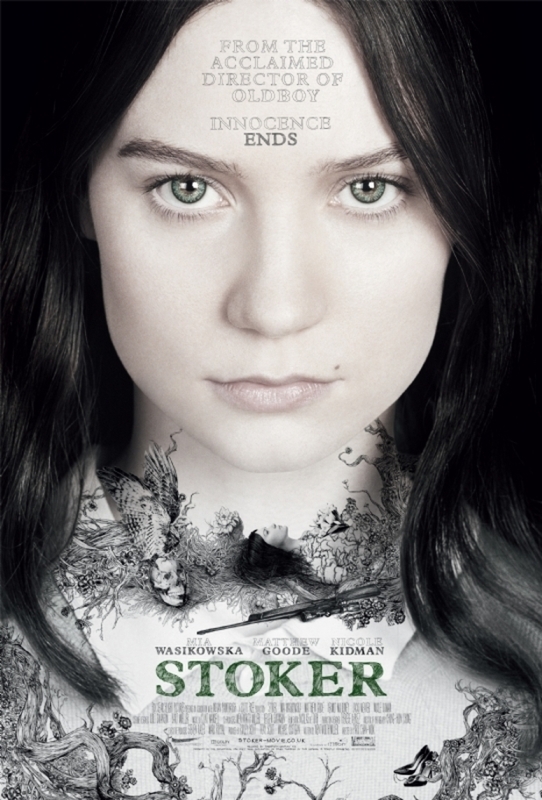 Best known for playing Alice in Tim Burton’s Alice in Wonderland, Wasikowska thrives in this much, much darker role. It’s also great to see Nicole Kidman deliver another strong performance in her limited screen time, but perhaps most surprising is Matthew Goode. He has one of those faces where he feels instantly familiar, but beyond his pretty face is a disturbing interior that comes out more and more throughout the film. While Wasikowska is the star, Goode is the one who keeps the wheels turning. Stoker is arguably Chan-wook Park’s most accessible work, but it’s still not for everyone (even notable amongst critics, given its 66% Rotten Tomatoes average). For those willing to brave the incommodious atmosphere, this is a rare great film released during the first quarter of the year. Park has transferred his talent masterfully to Hollywood, and I can’t wait to see where he goes next. I want to see this – now I want to see it even more! It’s a good one, man. Hope you are able to see it soon. Great review! I can’t wait to see this one, I love Park’s style so I’m sure I’ll be among those who dig this movie. Thanks! This may be Park’s most stylish film yet, so you’re in for a treat. Oh, I don’t know – it will be hard to beat Thirst! Good review Eric. It’s a very nutty film, but nutty in the right way. Yeah, it’s demented alright. I loved it. I want to see this as well. Chan-wook is one of my favorite South Korean directors. If you’re a fan, I’m sure you will enjoy this one as well. It does not disappoint. Most of the reviews in blogosphere I’ve read have been positive, so looking forward to seeing this. Visuals and atmosphere is what I’m getting is the movie’s strength. Yep, the visuals are definitely one of its strongest traits. I was surprised to see so many critics against the film, but at least there has been a lot of praise in the blogging world. Nice review Eric. I really enjoyed Stoker, thought it had a very Hitchcockian feel to it that I really liked. One of my favourites of the year so far. Thanks man. Yeah, I have heard this compared a lot to Shadow of a Doubt, which I badly need to see. Nice review. Despite watching several of Park’s films, the only one I’ve ever liked was Oldboy. The rest, I don’t know, I just couldn’t get into them. Thanks, Brik. Park’s films aren’t for everyone, but this one is arguably his most accessible yet. I’d say it’s worth a shot. Great review man! I really enjoyed this one as well, and I agree that the cast killed it here. Definitely Park’s most accessible film yet. Pumped for whatever he brings next. Thanks, Alex! I was worried how Park would translate to an English language film, but it was a pretty flawless transition. Great movie. I also missed my chance to see this in theaters and I’ve added to my list of films to watch ever since. I like the cast and the story and it seems like the reviews that are not embracing of the film don’t necessarily disparage it either. Thanks, Niels! This will be a great one to catch on DVD. Hope you enjoy it as much as I did. Well done Eric, I’m excited for this one. Haha yeah, “universally creepy” is a good way to put this. Nice to see we agree on this one, Ruth! An early highlight this year, for sure. Well, I have not heard of this film or the film maker even before this review, but now I’m itching to go look this, as well as the trilogy you mentioned up. (I am probably the last person in the world not to have seen Oldboy yet).. Good stuff. Oh man, you’re in for a treat with all of them. I’d recommend checking out the Vengeance trilogy first — all three are terrific films.